“A green hunting cap squeezed the top of the fleshy balloon of a head. 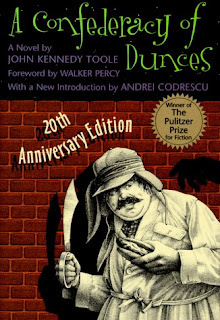 The green earflaps, full of large ears and uncut hair and the fine bristles that grew in the ears themselves, stuck out on either side like turn signals indicating two directions at once.” So enters in the first paragraph of this Pulitzer Prize winning novel a most memorable character, Mr. Ignatius Reilly. Ignatius is a “slob extraordinaire”, a lunatic on almost every level, a “fat Don Quixote” who at thirty years of age and nine years of school later, is jobless and still lives with his mother in a quiet little city named New Orleans. You'd think a character like that would be hard to like, but surprisingly by the end of the book I found him and the laughable cast of characters that make up this farce to be quite endearing. When Mr. Reilly’s long-suffering, slightly drunk mother gets in a car accident, our anti-hero’s life takes an unfortunate turn. She insists he leave the comfort of his yellow stained sheets, his screaming at the television, his castigating the world on big writing tablets that he keeps hidden under his bed, and get a job to help pay the damages. Fortuna has indeed dealt him a serious blow. What of his valve? What of his lute playing? But find a job he must, and we know of course, it will not end well. Woven within these promenades into the working world is a tapestry of endearing, and almost equally as obnoxious, secondary characters. Poor, always sick Patrolman Mancuso who couldn’t arrest anyone if he tried; Miss Trixie, the million year old secretary at Levi Pants who’s never allowed to retire no matter how bad she wants to; Miss Lee, the Nazi-like commandant of the Night of Joy Bar; Jones, one cool cat, floor sweeper who utters the words “Ooo-eee. Everythin in the Night of Joy firs rate,” every chance he gets; and the stripper Darlene and her murderess cockatoo. A complex cast in a complex, almost Dickens type of novel. I liked it, even though like Seinfeld, it was really about nothing of importance. Just a snapshot of life in New Orleans in the 60’s. A crisp, clear picture. The characters and scenery were so well described, I felt like I was there. As I've said before, for some reason I get this book mixed up with Babbitt by Sinclair Lewis. I have no idea why. I couldn't remember which of these two books I had to read in my sophomore english class, but some of the details you mentioned here, particularly about the Levi Pants factory, make me think it was this one. For all I know, we read both. It's possible that's why I get them mixed up! My sister thought this book was hilarious. I didn't enjoy it much in college, but at the time, I didn't know much about reading, either, so I've decided i need to go back and revisit it (as well as Babbitt, which I may or may not have read before). I haven't ever read Babbitt that I know of anyway, but this one is definitely a fun read. I kept thinking of Falstaff and Shakespeare. He's that kind of character. I love an anti-hero. This sounds good. Then this book is totally for you. Hey Lula- So glad to have you on board for the book club. This review actually finally pushed me into reading A Confederacy of Dunces so I was really glad to see that you signed up. You should have some great insight. Make sure to keep checking in with us about your progress so we know how every one is doing!! Loved your review and can't wait to write me own. Almost done with it.